In 1909, after the iron bridge was found to be unsafe, a committee involving knowledgeable people from Hudson, Nashua, and managers of the street railroad company began plans for a replacement bridge. At first the plan was to replace the bridge with either an iron or a steel bridge. After consideration, this plan was tabled in favor of far more substantial structure of reinforced concrete. By June 1910 there was a contract to erect a reinforced concrete bridge with sufficient strength for a 50 ton electric train. This bridge was to have five arches, four piers in the river, and an abutment on each end. The roadway was to be 30 feet with a 6 foot sidewalk on the north side. There were problems during construction, especially with one of the piers on the Nashua side. A final inspection was made and the bridge accepted in November 1912. During it’s lifetime the traffic from the eletric cars dimished and ended. 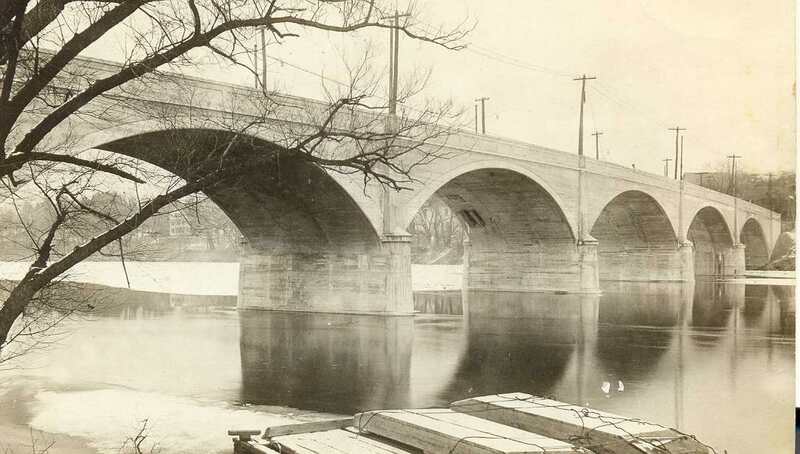 The old concete bridge survived the flood of 1936. Over the years, travel from autos increased in both weight and volume. That increased usage, plus the demands from the trucking industry took its toll on the bridge. Discussions regarding a new bridge began in the early 1960’s and reached a milestone in 1970 when the Veterans Memoial Bridge was opened to the public. Emergency repairs were made to the concrete bridge in order to ‘shore it up’ for use during the construction period. Once the north span of the new bridge was opened the old concrete bridge was permanently closed and within a few years was replaced with the new Taylor Falls Bridge (southern span). Photo from the collection of the Hudson Historical Society. By Ruth M Parker in Bridge Area, Bridges on August 28, 2015 . Thanks!! If you are from Hudson or familiar with Hudson let us know if there are places in town that interest you…possible future blog posts! !